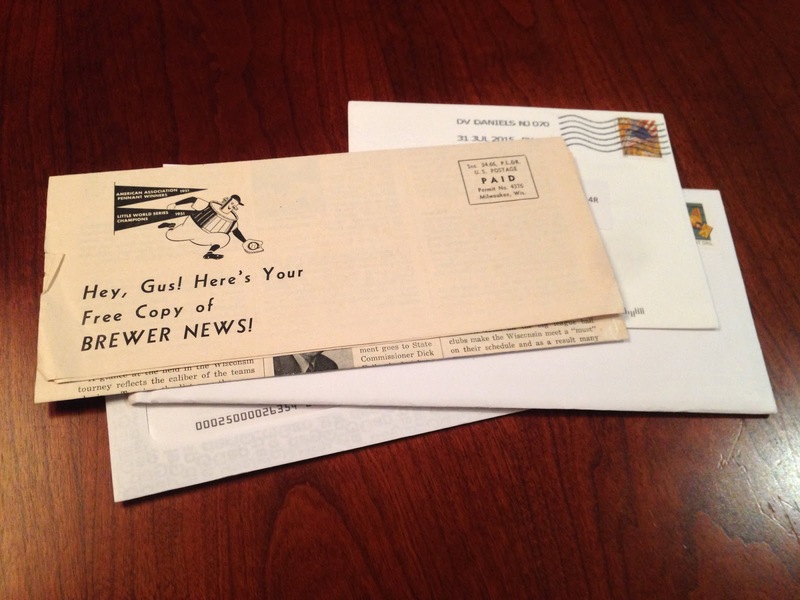 This is a recent acquisition for the BorchertField.com archives, a Brewer News newsletter from August 1952, very near the end of the team's existence. The layout is unlike the others we've looked at before; gone is the masthead emblazoned with mascots in favor of two pennants celebrating the team's twin accomplishments in 1951, the American Association pennant and their Little World Series win. The Brewers used the same graphic on their pocket schedules in '52. Fantastic headline - our "Amazing, Blazing Brews Still in Thick of Flag Fight!" The team was closing in on a second consecutive American Association pennant and about to start their final home stand of the season. Almost every game was a special promotion. 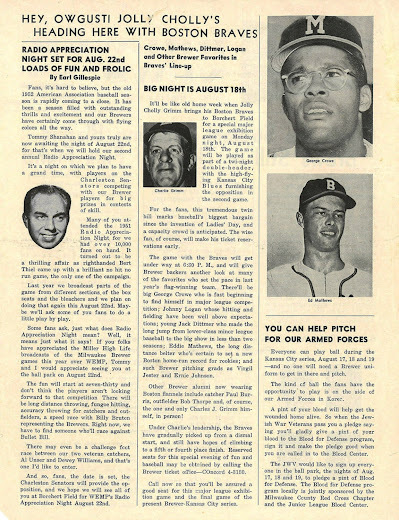 Of particular note are the upcoming exhibition game against the "parents", the Boston Braves, and the "stunt-studded Radio Appreciation Night" honoring team broadcasters Tommy Shanahan and soon-to-be-legendary Earl Gillespie. 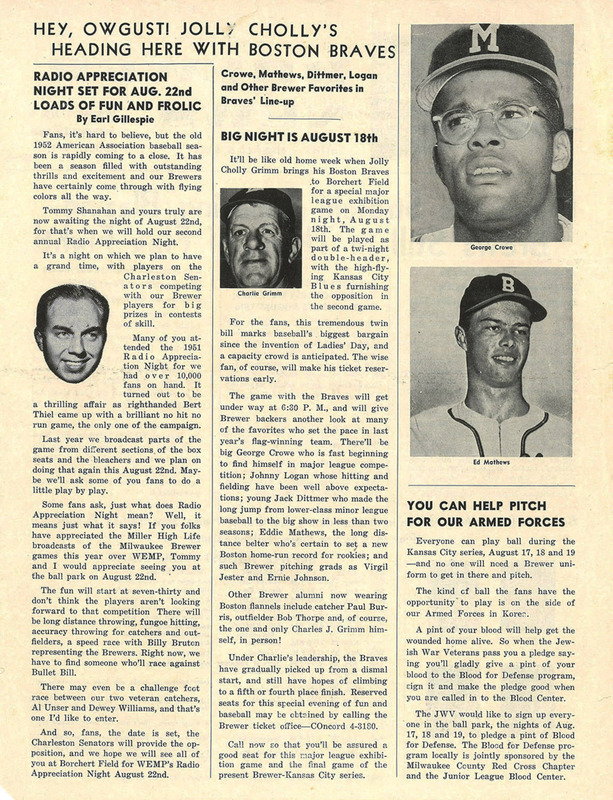 On the next page, we learn more about that exhibition game with the Braves. Of course, this meant the Borchert Field return of former Brewers skipper Charlie Grimm. 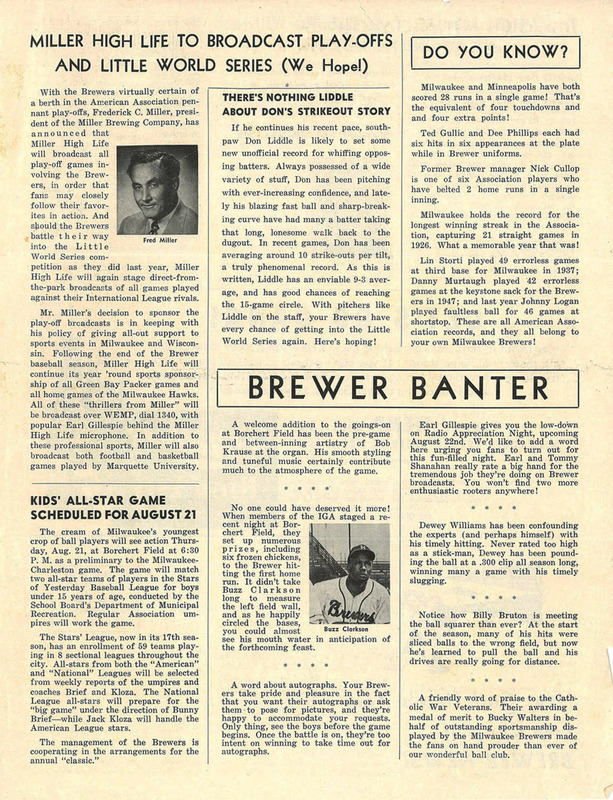 Jolly Cholly wasn't coming alone, as the article promised fans will see popular former Brewers such as Eddie Mathews, first baseman George Crowe (who had been the second African-American player to play for the club), shortstop Johnny Logan, second baseman Jack Dittmer, catcher Paul Burris, outfielder Bob Thorpe and pitchers Virgil Jester and Ernie Johnson. The next page is chock-a-block with interesting tidbits, including plans for the upcoming playoffs. Although the Brewers hadn't sealed their place yet, they entered August with a 5-game lead over second-place St. Paul and were expecting postseason play. Miller Brewing President Fred Miller was making sure Milwaukee baseball fans wouldn't miss a minute of that action, agreeing to sponsor broadcasts of all playoff games. 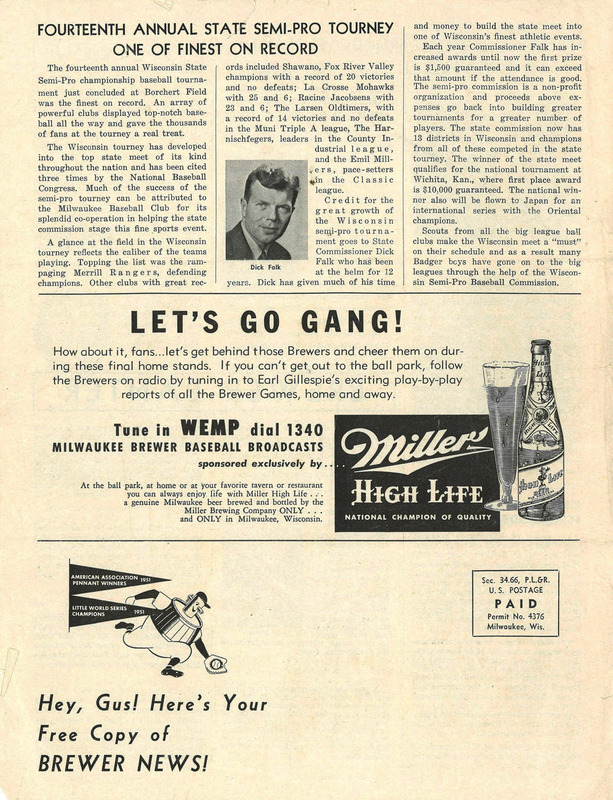 Miller was a longtime supporter of Cream City sports, and no less than Charlie Grimm later suggested that had Miller not died in a plane crash in 1954 he would have prevented the Milwaukee Braves from leaving town. 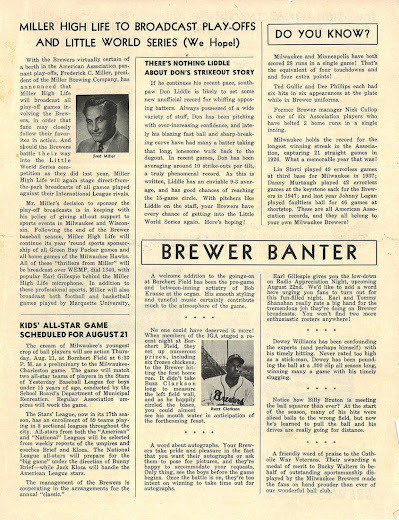 The back page contains a report on the fourteenth annual Wisconsin State Semi-Pro baseball tournament, which had been recently held at Borchert Field. The Brewers had been a major contributor to this event since its inception. This year's competition was held at the Orchard from July 28th through August 1st. 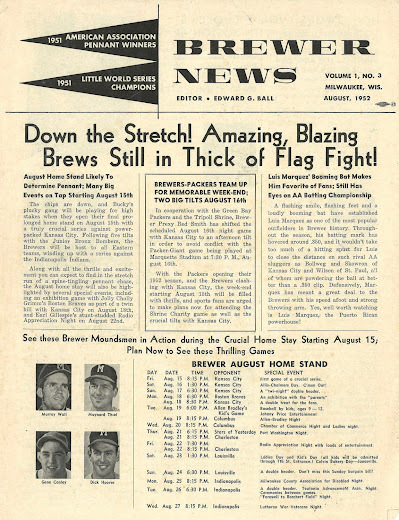 The championship game was held late on that final day (the Merrill Rangers defeated the Milwaukee Police, 9-4), and the lack of mention in this newsletter may indicate that it went to press before the game was over. The bottom third of this page is also illuminating; unlike earlier versions of the newsletter, this one is intended to be folded in thirds and mailed. Team mascot Owgust makes his appearance here, again with the twin pennants. 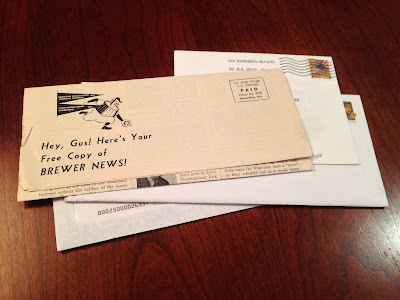 How cool would it be to receive "your free copy of BREWER NEWS" in your afternoon mail?